314 Marlborough is located on the south side of Marlborough, between Fairfield and Gloucester, with 312 Marlborough to the east and 320 Marlborough to the west. 314 Marlborough was designed by architect Samuel D. Kelley and built in 1879 by Goldthwait & Chapin, builders, for merchant and building contractor Samuel Tarbell Ames, for speculative sale, one of two contiguous houses (314 and 320 Marlborough). 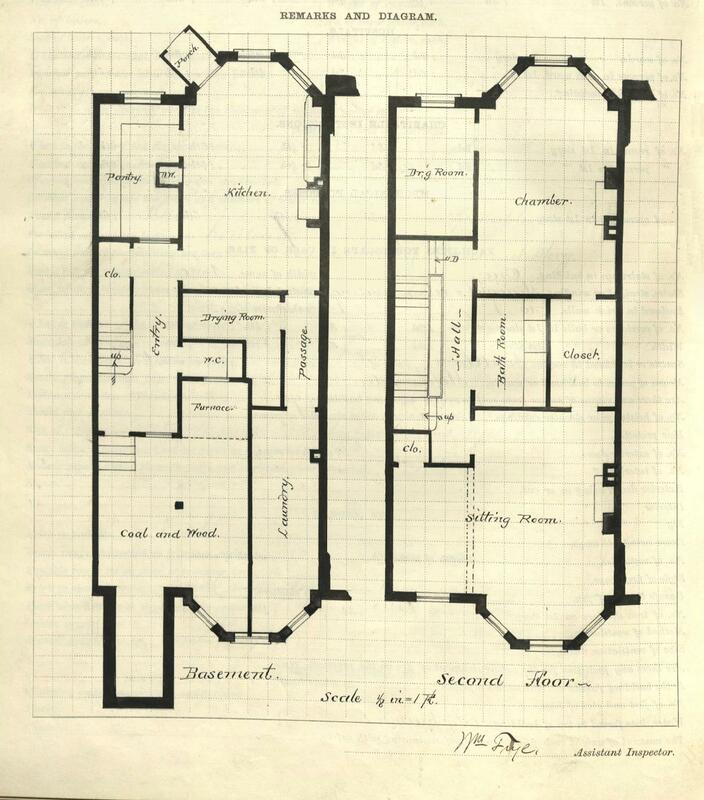 He is shown as the owner on the original building permit application, dated October 14, 1879, and on the final building inspection report, dated October 25, 1880. The houses were built on land owned by Samuel T. Ames’s son, Harvard law professor James Barr Ames. He had purchased the lot for 320 Marlborough on May 26, 1879, from T. Jefferson Coolidge, and the lot for 314 Marlborough on June 5, 1879, from William B. Bacon. The land originally was part of one of several parcels purchased from the Boston Water Power Company on January 29, 1866, by a real estate investment trust formed by John Templeman Coolidge, Franklin Evans, and Charles Henry Parker. The trust subdivided the parcel into lots, which it sold to investors and builders, who then frequently resold the lots to others. 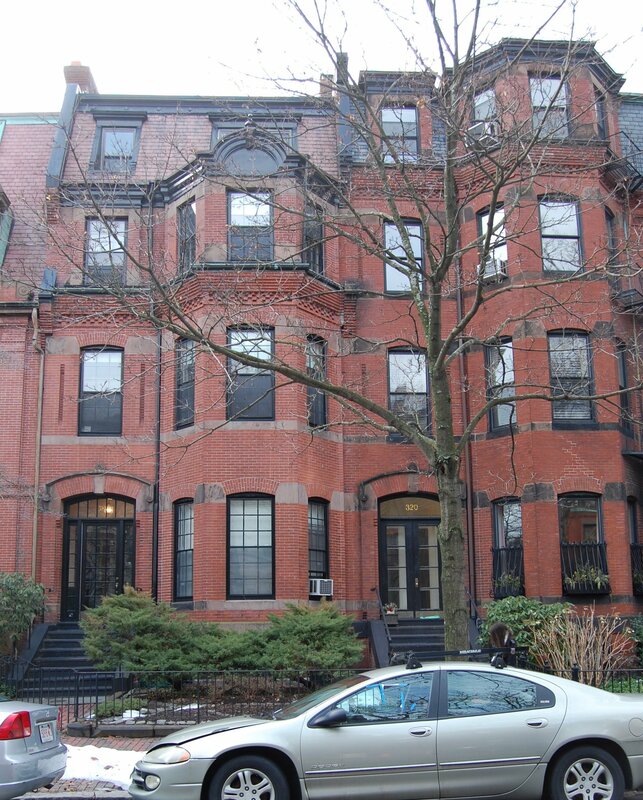 Click here for an index to the deeds for 314 Marlborough. On April 1, 1880, 314 Marlborough was purchased from James B. Ames by Dr. Henry Jabez Barnes, a physician. In June of 1880, he married Augustine Lelierre. They made it their home and he maintained his medical office at the house. 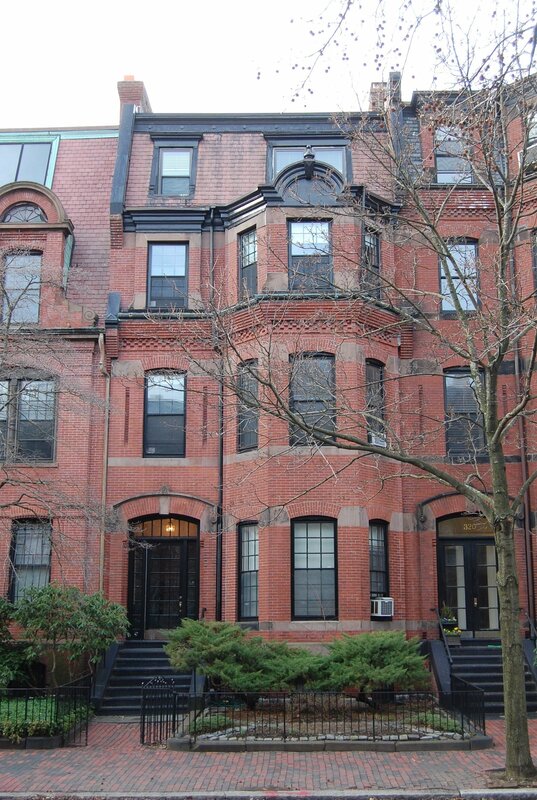 Prior to their marriage, he had been a boarder at 17-19 Beacon Street. 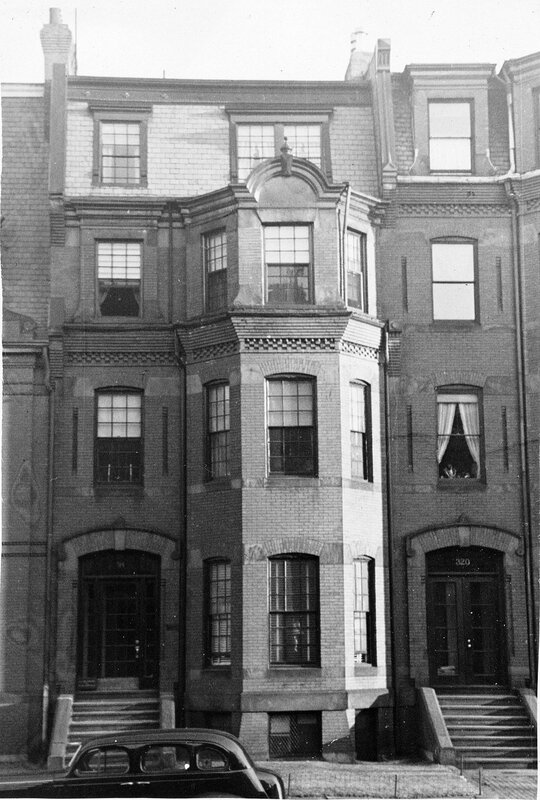 They continued to live at 314 Marlborough during the 1884-1885 winter season, but moved thereafter to 386 Beacon. On April 11, 1885, 314 Marlborough was purchased from Henry Barnes by Elizabeth Frances (Banchor) Waters, the widow of Robert Henry Waters, a shipping merchant and sugar manufacturer. Their children — Edith Beach Waters, Elizabeth Banchor Waters, Richard Palmer Waters, and Bertram Gordon Waters – lived with her. They previously had lived at 474 Shawmut Avenue. Elizabeth (Banchor) Waters died in March of 1887. In her will, she left 314 Marlborough to her daughters, Edith and Elizabeth. Edith, Elizabeth, Richard, and Bertram Waters continued to live at 314 Marlborough during the 1894-1895 winter season, but moved thereafter. By the 1896-1897 season, they were living at Trinity Court (southeast corner of Dartmouth and Stuart). Richard Waters was a wool broker, and Bertram Waters was a student at Harvard Law School (he later would become an attorney and then a surety bond and insurance broker). Edith and Elizabeth Waters continued to own 314 Marlborough and lease it to others. By the 1895-1896 winter season, 314 Marlborough was the home of Rev. Thomas White Nickerson and his wife, Mary Louisa (Hoffman) Nickerson. In September of 1895, he had become Rector of the Church of the Messiah (Episcopal) in Boston. They previously had lived in Paterson, New Jersey, where he was Rector of St. Paul’s and St. Luke’s Church. They continued to live there during the 1897-1898 winter season. In 1899, they traveled to Europe, after which he became Rector of St. Stephen’s Church in Pittsfield. 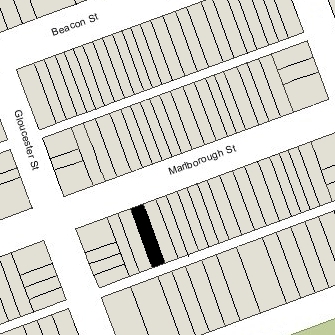 312 Marlborough was not listed in the 1899 and 1900 Blue Books, and appears to have been omitted from the 1900 US Census. By the 1900-1901 winter season, 314 Marlborough was the home of Miss Louise Porter Haskell. She previously had lived at 337 Marlborough. By 1903, she had been joined by her sister, Mary Elizabeth Haskell, who established The Haskell School for Girls at the house (it is quite likely that Mary Elizabeth Haskell lived with Louise Haskell before 1903, but only Louise Haskell was listed in the Blue books for 1901 and 1902 and in the 1902 City Directory; information on Mary Haskell’s school dates its beginning from 1903). Louise Haskell taught history and literature at her sister’s school until her marriage in June of 1903 to geologist Reginald Aldworth Daly, after which she moved. In 1904, Mary Elizabeth Haskell met Gibran Kahlil Gibran, who would become a noted artist, poet, and philosopher, best known for his work, The Prophet. She became his friend, advisor, and patron. She helped finance his education in Paris, arranged exhibits of his art, and edited his writings. Emily Michel, who was a teacher at Mary Haskell’s school, became his first model. Mary Elizabeth Haskell continued to live at 314 Marlborough and operate The Haskell School until 1919, when she moved to Cambridge to become head of The Cambridge School. She married in 1926 to Jacob Florance Minis, a commission merchant in Savannah. By 1920, 314 Marlborough was the site of the Berkeley Preparatory School under the direction of Henry Hopkinson, principal. Elizabeth Waters died in 1927 and left her interest in 314 Marlborough to her sister, Edith. Berkeley Preparatory School continued to be located there until about 1930 , when it moved to 1089 Boylston. 314 Marlborough was not listed in the 1931-1935 Blue Books, and the house was shown as vacant in the 1931-1935 City Directories. Edith Waters died in 1934, and on April 24, 1935, 314 Marlborough was purchased from her estate by Hadessa Podren, trustee of the 314 Marlborough Street Trust. In May of 1935, she filed for (and subsequently received) permission to convert the property from a single-family dwelling into four apartments. On April 17, 1944, 314 Marlborough was acquired from Hadessa Podren by John H. Boole and Lootfi M. Gayzagian, trustees of The Bianji Trust. The property changed hands and on November 14, 1949, was acquired by Horace Upham Ransom. He and his wife, Sarah Chaplin (Bent) Ransom, lived in Meredith, New Hampshire. On October 2, 1950, 314 Marlborough was acquired from Horace Ransom by his son-in-law and daughter, Dr. Arthur Wallace Tucker, Jr. and Martha Elizabeth (Ransom) Tucker. Arthur Tucker, Jr., was an obstetrician and gynecologist; Martha Tucker was an exfoliative cytologist. They lived in Needham and later in Chestnut Hill. On June 27, 1974, 314 Marlborough was acquired from the Tuckers by real estate dealer Richard Nemrow. On July 29, 1974, he transferred the property to himself and Robert F. Clark as trustees of the 314 Marlboro Realty Trust. On June 2, 1992, the trust transferred the property back to Richard Nemrow, and on December 28, 2012, he transferred to the Nemrow Massachusetts LLC. At the time of the transfer, he was a resident of Harpswell, Maine. In August of 2014, Marc Truant of Marc Truant Associates, architects, filed for (and subsequently received) permission to convert 314 Marlborough into a single-family dwelling and significantly remodel the property. On October 27, 2014, 314 Marlborough was purchased from Nemrow Massachusetts LLC by the Marlborough AG Nominee Trust (Jed Clark, trustee). 314 Marlborough remained a single-family dwelling in 2017.